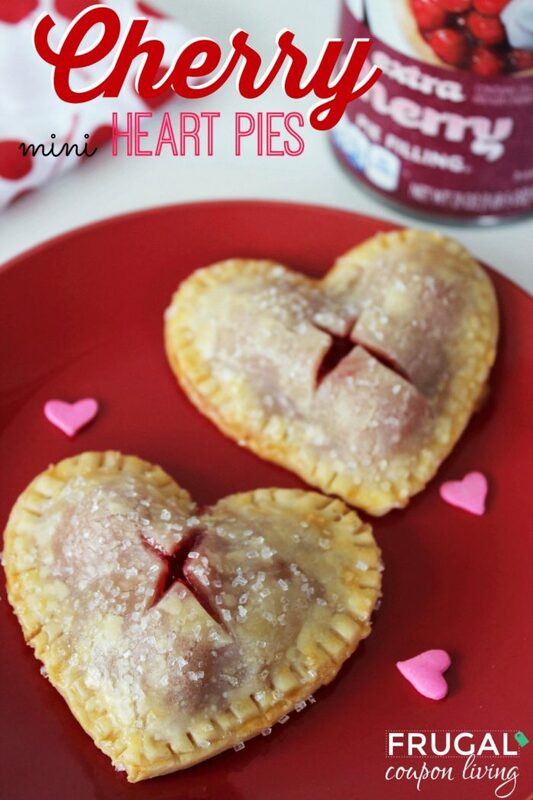 These Mini Cherry Heart Pies are so easy to make you might find yourself making them more often than February 14th! 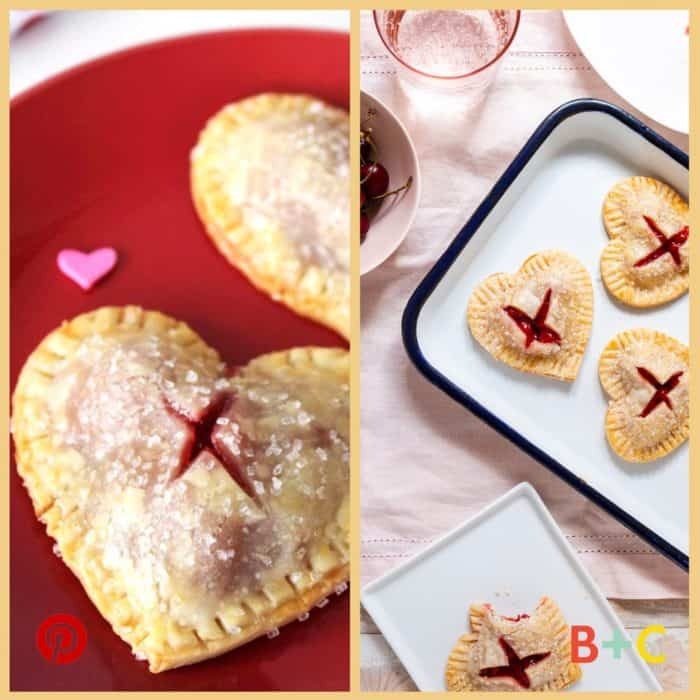 Using Refrigerated Pie Crust and Cherry Pie Filling, consider including the kids in this easy as 1, 2, 3 Valentine’s Day recipe. Your ideal Valentine’s day might include beautiful flowers, breakfast in bed, a glass of rose, but not mine. My ideal Valentine’s Day includes dessert, namely pie! With the season of loving being right around the corner, we are excited to share this amazing holiday dessert. 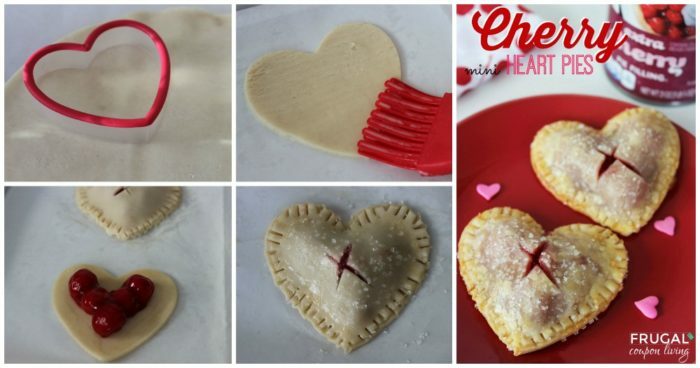 Not only is the heart shape perfect for February, but the ease of the recipe will have you falling in love with this heart shaped hand pie. Consider sharing this recipe as a gift for a teacher or as an after dinner treat for the family. The Valentine’s Day Food Craft is perfect for incorporating little hands, so have your little baker get ready with the sugar and a heart shaped cookie cutter! Pie Crust Tip! 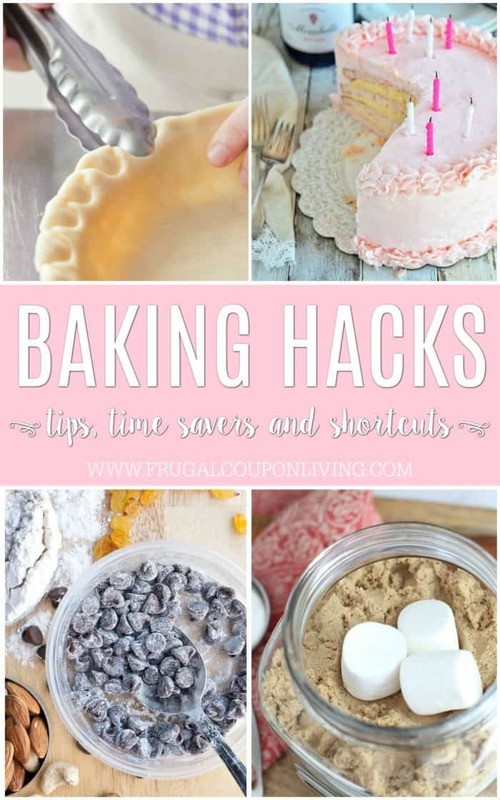 Take a look at our Baking Hacks and Tips for more ideas on how to perfect pie edges! Lay out your pie crust and using a 3 to 4″ heart shaped cookie cutter, cut about 16 hearts. Cut as many shapes as you can, then reroll scraps as needed to get more hearts (get an even number). Mix your egg and milk to make an egg wash.
Place half of the hearts on prepared pan(s). Use egg wash to wet the edges of the hearts on the pan. Place a small amount of the pie filling in the center of each heart. Make a small x cut in the center of the remaining half of the hearts that are not on the pan. Place your x heart crust on top of each filled heart and press and crimp edges. A fork can help crimp. Brush sealed pie with egg wash and dust with sparkling sugar. Bake for 14 to 16 minutes until crust is browned. First, preheat oven to 350. Lay out your Refrigerated Pie Crust. I like to lit the pie crust get slightly room temp before the next step. Using a 3 to 4″ heart shaped cookie cutter, you should get 8 to 10 pies from 1 box of crusts. Cut as many heart shapes as you can. Reroll scraps as needed for more pieces. You want an even number of hearts to make the top of the pie and the bottom of the pie. After you are done, mix together your egg egg and milk to make an egg wash.
Next, use egg wash to wet the edges of the hearts on the pan. Make a small x cut in the center of the remaining half of the hearts. Finally, brush sealed pie with egg wash and dust with sparkling sugar. Bake for 14 to 16 minutes until crust is slightly browned. Take the challenge! This recipe was featured on Brit+Co – we would say it has two thumbs up! 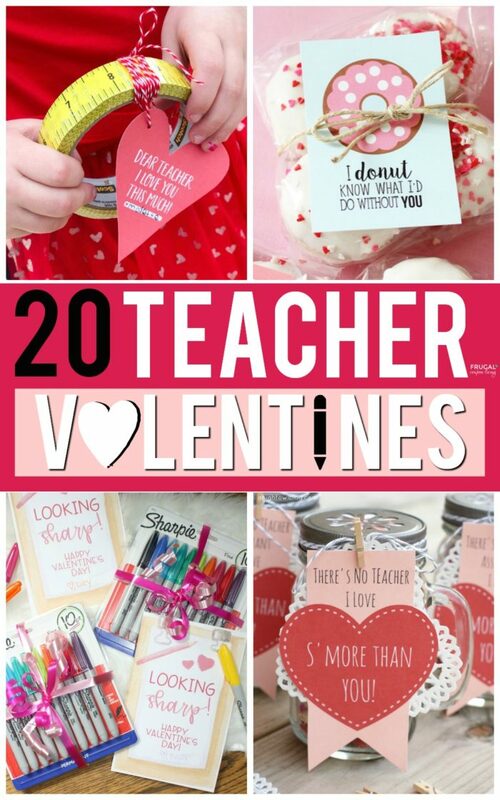 Share your love with your teacher with these Teacher Valentine’s Day Printables. Pin to Pinterest. I made these using raspberry jam instead of cherry pie filling. They were a huge hit! Next time I’ll increase the oven to 375, as they were rather pale when done. thanks for the idea. Thanks for your helpful tip… I need to try the jam!